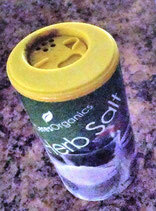 Ceres Organic Herb Salt is a combination of sea salt with 15% aromatic herbs and vegetables, dried at lo temperature. The salt is no refined iodised or bleached and does not contain the ant-caking agents or bleaching found in many refined table salts. I has a great flavour. Use it sparingly, as the extra minerals and herbs often enhance the taste. Especially on eggs, I use it myself for a long time. I won't miss it any more - so much better that ordinary salt. This salt may be affected by humidity, but it will not effect the quality. Keep in a cool and dry place.